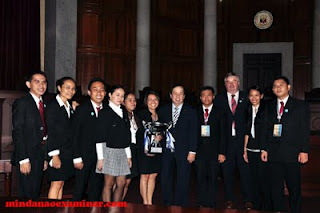 MANILA - The University of Cebu bested 16 other law schools in the recent National Moot Court Competition on International Humanitarian Law (IHL), organizers said Saturday. It was also the first time in the history of the moot court competition that a school swept all major awards. The team, composed of law students Virgil Vallecera and Manuel Elijah Sarausad, beat Silliman University—the school that topped last year’s championship—in the finals held yesterday afternoon at the Supreme Court en banc session hall. The University of Cebu also emerged winner of the role-play challenge and best memorial; while Vallecera was recognized as best mooter in the eliminations and finals. But the victory did not come easy as both teams faced tough grilling from a panel of judges composed of Associate Justice Lourdes Sereno, feisty laywers Harry Roque and Lorna Kapunan, Dr. Mario Aguja of Mindanao State University-General Santos, and Fork Leong Yow, legal officer of the ICRC regional delegation in Kuala Lumpur. “Personally I feel relieved that it’s all over, and I’m happy at the same time. We took the comments of the judges very seriously. It’s really a challenge for us from today up to the time we go to Hong Kong. We really need to work harder this time because we’re now representing the Philippines,” said Sarausad, who was named second best mooter. The winning team will be sent by the ICRC to the Asia-Pacific regional finals in Hong Kong in 2012. These competitions are aimed at promoting IHL, the body of law that seeks, for humanitarian reasons, to limit the effects of armed conflict. As guardian of IHL, the International Committee of the Red Cross (ICRC) promotes awareness of this law to concerned sectors including the academe. Students from 17 law schools across the country took part in the annual event organized by the ICRC, the Philippine Red Cross, the Philippine Association of Law Schools, and the Supreme Court of the Philippines. Besides the two finalist teams, participants came from Arellano University, Ateneo de Davao, Ateneo de Manila, Cagayan State University, Lyceum of the Philippines, Saint Louis University, San Beda College, San Sebastian College of Law, Southwestern University, University of Batangas, University of the Cordilleras, University of San Carlos, University of Santo Tomas, University of St. La Salle, and University of the Philippines. The moot court contest began in 2005 with only six participating schools but it is now considered a prestigious event for law students, being the only moot court competition that holds its finals in the en banc session hall of the Supreme Court. This year’s competition was hosted by Ateneo de Manila University School of Law, which is celebrating its 75th anniversary this year. “The fact that 17 schools took part in this competition is really important, when in the past, no one was interested in IHL. Now it is the biggest moot court competition in the country and maybe even in Asia. This is great news for IHL, and we have the moot court competition to thank for making this body of law more known,” said Roque, a perennial moot court judge. The 2011 Moot Court competition was dedicated to Justice Leonor Ines Luciano, former chair of the PRC’s IHL National Committee who passed away this year. At the closing ceremonies, it was announced that beginning next year, the Best Mooter award will be named in her honour to commemorate her work promoting IHL.